Britain is in danger – but what has happened to Professor Dunning’s comrade in arms, Lionheart? 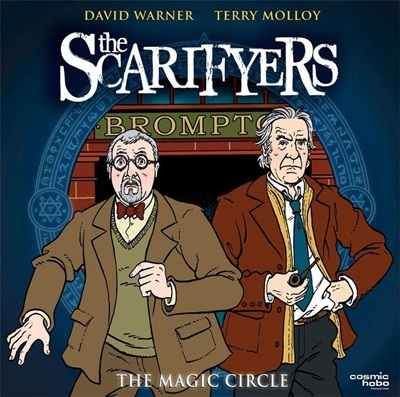 For those who haven’t caught up with the adventures of the Scarifyers on CD or through BBC Radio 7 (or 4 Extra as it’s been rebranded), the series follows the adventures of timorous Professor Dunning and the brave former Inspector Lionheart as they work for British Secret Service department MI13. This tends to bring them into contact with matters that are rather out of this world… and characters played by Brian Blessed. It stars Terry Molloy (Doctor Who’s Davros) as Dunning, and Nicholas Courtney, best known as Brigadier Alastair Lethbridge-Stewart, as Lionheart. But sadly Nick Courtney passed away at the start of this year, and it could have been the end of The Scarifyers. Instead producer Simon Barnard and his team have continued the story, and made Lionheart’s disappearance, and eventual death, part of the tale. Dunning can’t find Lionheart so seeks out his old colleague, Harry “Thumper” Crowe, played by David Warner, and together they follow in Lionheart’s footsteps on what proved to be his final case. It could have been maudlin, but it isn’t – even the final track on CD2, in which the cast remember Courtney. It’s a proper Scarifyers story (in places you can sense where the serial numbers of the original version have been filed off to work it into the new template) with a new villain and alarming amounts of hocus-pocus going on of both the magical entertainment and darker magic varieties. There are good jokes, bad jokes, and some wonderfully “wrong” moments where you can’t quite believe that the team have got away with it.